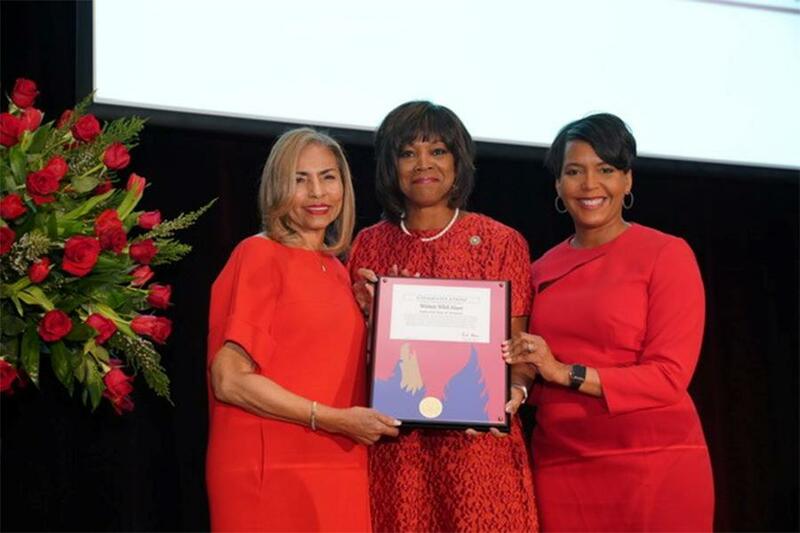 Atlanta Mayor Keisha Lance Bottoms honored Women With Heart and the 10th anniversary of Heart Healthy Week by presenting the Morehouse School of Medicine volunteer group with the city’s highest honor, the Phoenix Award. 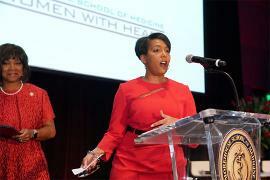 Addressing attendees at this year’s Women’s Heart Healthy Luncheon, Bottoms – one of the event co-chairs – praised the organization’s achievements over the past 10 years. Those include more than $1.4 million raised, over 100 students awarded scholarships, thousands of free health screenings provided to seniors and other community members, and countless lives saved through education. 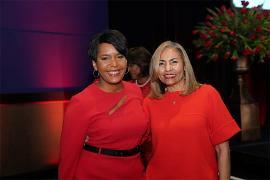 CBS 46 reporter Karen Greer once again graced the dais of the Georgia Aquarium’s Oceans Ballroom as the event’s mistress of ceremonies and presided over the silent auction that included items such as jewelry, luxury vacation trips, weekend getaways, golf outings, and fine dining. 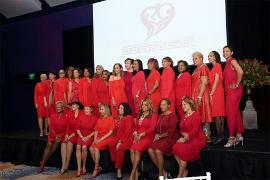 Keynote speaker Dr. Jayne Morgan, director of cardiovascular research at the Piedmont Health Institute, discussed the “top 10 workplace challenges for women” that can contribute to heart disease. Things such as “housework in the workplace,” in which women are assigned lesser tasks such as party planning, taking minutes or cleaning up; women feeling like they must display one personality in the office and another, more real, version of themselves outside of work; or the anxiety that results from constantly questioning themselves, can all take their toll over time. Morgan also pointed out the differences in the words attributed to men versus women in the workplace – for example, men are assertive, women are bossy. Women’s body language is also frequently misinterpreted, she notes. Crossed arms, clasping or sitting on hands are not necessarily signs of being closed off or anxious. The answer is often much simpler. “It’s too cold! Turn the thermostat to the right a little bit,” Morgan said. Outside the workplace, women are poorly represented in research, drug and treatment trials, and face an inherent bias in patient care. “We’re told we’re hysterical, too emotional, that we’re having a panic attack,” Morgan said. Three women who were not having a panic attack but instead suffered real-life heart attacks, shared their stories of survival. 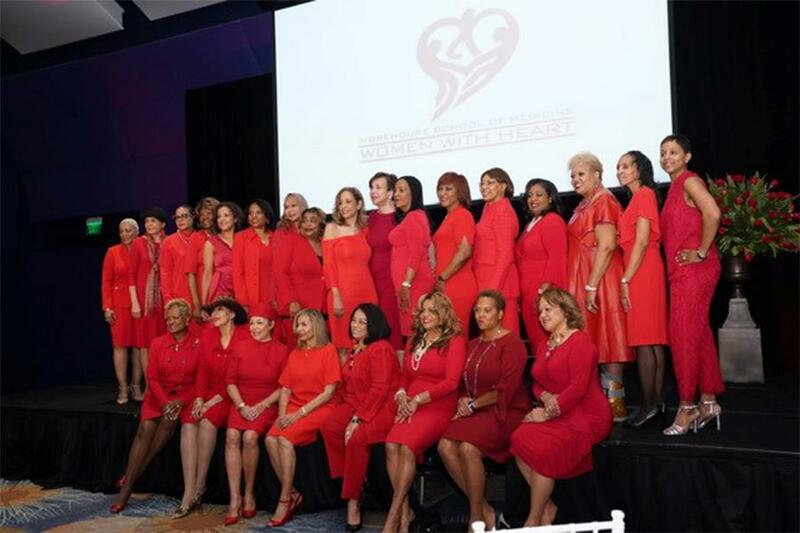 The tales from Cecelia Bailey, Dr. Pamela Daniels and Melanie Thompson demonstrated the vivid contrast in symptoms that can occur among women in the throes of a cardiac incident. Their experiences ranged from the chest-crushing pressure most associated with a heart attack to simple symptoms such as unexplained fatigue, shortness of breath or increased anxiety, with no accompanying chest discomfort. MSM President and Dean Valerie Montgomery Rice, M.D., took time to honor Eilene Maupin, former MSM first lady and Women With Heart founder, who launched this initiative in 2009 over lunch with a group of 10 friends. After a tribute video retrospective, Montgomery Rice closed by announcing that MSM would contributing $10,000 the Eilene Maupin Women With Heart Endowed Scholarship Fund, and that she and her husband were personally donating an additional $5,000. Former MSM President John Maupin, M.D., announced the creation of the fund honoring his wife at the Men’s Heart Healthy Breakfast the day before with his personal gift of $50,000 and a challenge for others to join him. The $15,000 in contributions announced by Montgomery Rice were the first in what the school hopes will be many more responses.